The Sailthru Zendesk app is Sailthru’s official integration for Zendesk. The app is designed to provide valuable and actionable data from Sailthru to support agents when working with customers. The app synchronizes certain profile data in both directions between Sailthru and Zendesk. This allows support agents to interact with customers’ Sailthru profiles, while also allowing marketers to act on their statuses in Zendesk. In-ticket user list membership and opt-out status management. In-ticket Sailthru data on customer behavior (e.g. engagement, last open, signup time). Profile data sync between Sailthru and Zendesk, with support for changing customer email addresses from within Zendesk (syncing the new email to Sailthru while leaving the rest of the user profile intact). Set customers’ health to inform your Sailthru marketing strategy through a profile var. Customer Value Score: a 1-4 scale representation of their PM segment based on predictions of 30-day pageviews (for publishers) or 365-day revenue (for ecommerce). High Value Customer Tagging: The Sailthru app will automatically tag high value customers based on Customer Value Score with a sailthru_highvalue label in Zendesk. Contact your Customer Success representative or Support to receive API Application keys. Once you have your API keys install the Sailthru app from the Zendesk Marketplace. Your CSM will also implement a process for ongoing management of user syncing during setup. For this step we’ll work with you to authorize your Zendesk application to sync users to Sailthru. Once installed, visit a ticket and open up the right sidebar. If the customer has a profile with Sailthru, the screen will populate with their Sailthru data. 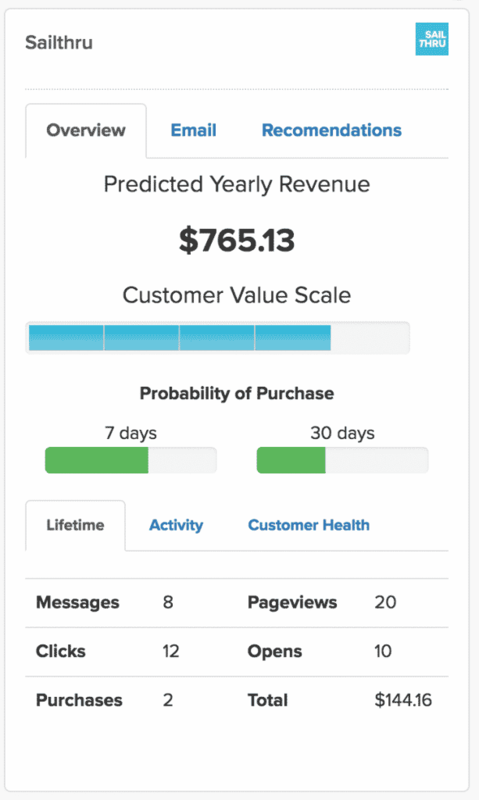 The Overview page shows predictive stats at-a-glance, as well as stats about lifetime interaction with Sailthru, activity highlights (sign-up date, most recent pageview, open, click, and more), and allows you to set Customer Health as a var in Sailthru. 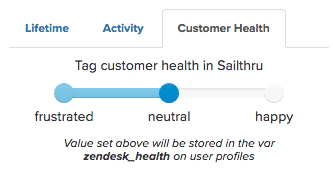 Moving the Customer Health slider between neutral, happy, and frustrated will send the zendesk_health var to Sailthru with the corresponding value from the slider. You can then use this for suppression lists as well as various email strategies. For example: If a Zendesk agent identifies that a customer is clearly unhappy and that it would cause more frustration if they were to receive a marketing campaign in the next day, the agent could change the status tofrustrated and the marketing team could suppress any campaign messages to that user,in an effort to reduce the chance of the customer unsubscribing. 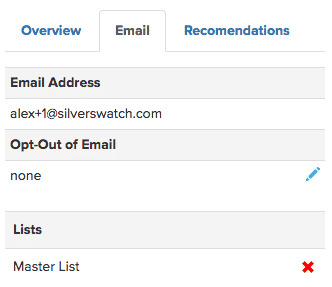 From the email tab you will be able to remove the customer from any current list subscriptions, as well as edit their opt-out status. Once integrated, the following vars will be sent to and continue syncing with your Sailthru user profiles.